Q: I have doubts if I could still be hired. My background is in payroll preparation way back in previous employment. And more on Admin work. Another concern is how much do I need to invest? All 3 concepts are not really true. And I’m just being nice. 1. Virtual Client wants 3 excel files merged into one document. 2. Client wants you to google the CEO and Chief Accountant of 100 companies in England based on this list from Techcrunch 1000. 3. Client wants you to transcribe 4 hours of seminar audio into words, into MS Word. In each case, your employment background, gender, age, special awards and previous experience all do not matter. What matters really is….. CAN YOU DO IT in the deadline they give? And if the deadline is impossible (in your mind), can you type “A more realistic deadline is 2 weeks from now.” instead of doing the normal thing (say nothing and never talk to the client). 1. How to merge excel files. 3. How to transcribe, what tools to transcribe audio. That’s not a skill or age problem. How does one fix attitude? You think Jesus would say ” “I give up, I’ll never be able to learn how to google!”? I mean even people with NO HANDS can google this ” “How to Google like a PRO”” –only because they are willing. If quadriplegics can google, why can’t other people? Because of your age, I suggest you hurry. And because your age, MAYBE you know the value of SHORTCUTS and LEARNING from other people’s mistakes. 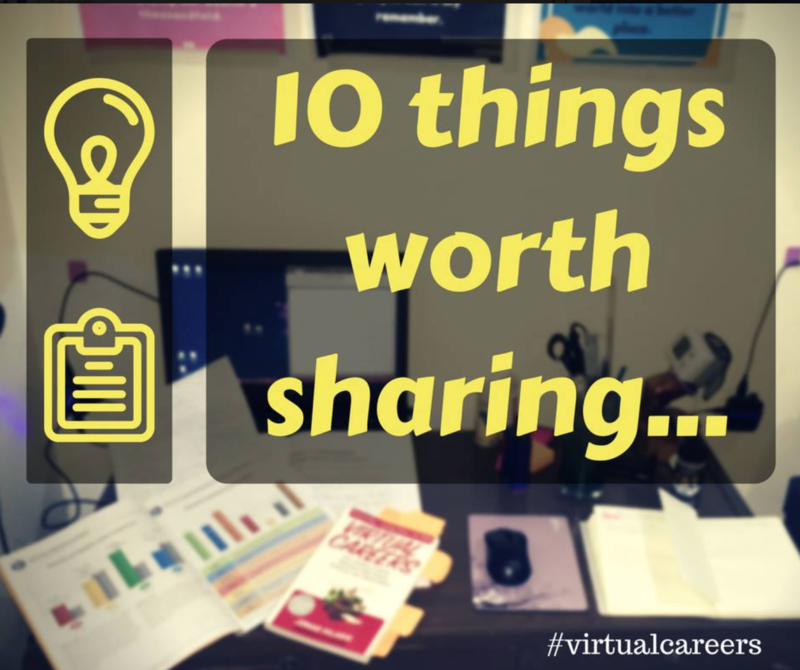 a) Read my book Virtual Careers 10x, taking notes as you go. b) Get the 4 Courses in 1 Bundle in Virtual Careers Academy – while there’s still a massive save. That should be enough to earn high. 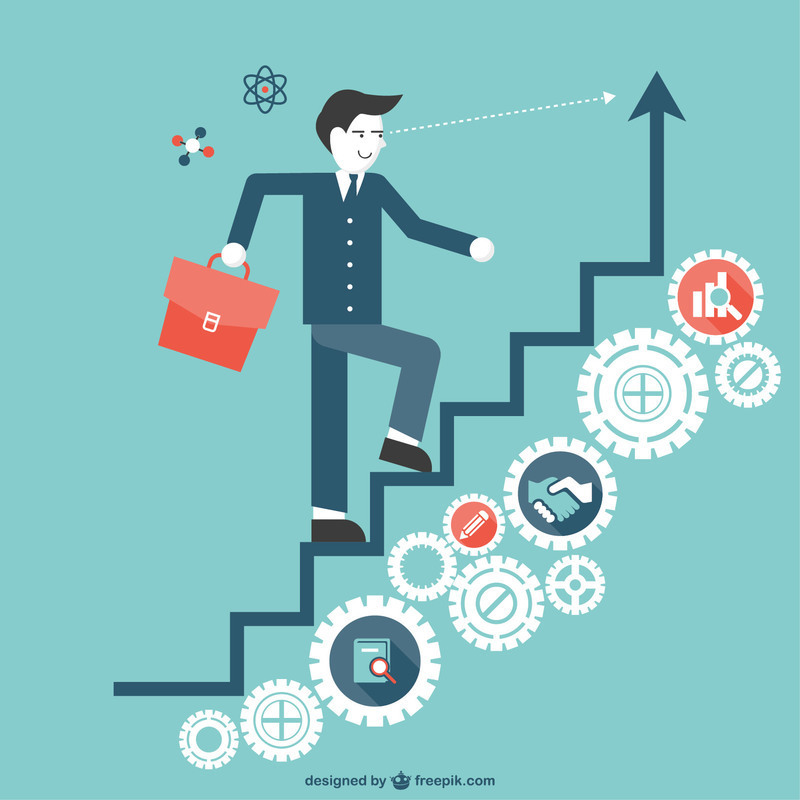 If not enough, because of course a) and b) doesn’t necessariliy gives you the skills – then pick a SKILL COURSE in http://virtualcareersacademy.com. But it all depends on your DISC, w/c you will find out in ” 4 Courses in 1 Bundle in Virtual Careers Academy”. Get the “4 Courses in 1 Bundle in Virtual Careers Academy” : –NOW at 60% off! P.S. Downloadable 4 courses for newbies is now available at 60% OFF so you’ll get the guidance you need to start ASAP. P.S. Get any skill course at https://virtualcareersacademy.com/, 30% OFF, using the coupon code: GOHOME. I was talking to 2 peeps, na- wawalan ng motivation. Ikaw –what did you DO to get it? I just look at the kids. Or the fact that sometimes di ko napapansin may sugat na pala sila. Or may kati-kati na malaki na pala…or kinakain na nila ang sipon nila …and realize — i need to PAY ATTENTION to them. I would call that motivation, reason why…big why, emotional why… Etc. I could also look at my old desk. (8 years old) and see the mess that it’s in. And all the fixes I’ve done with it para maging “good place to work in” and realize – I need to Fix it by replacing it –and that’s not a simple thing – so I need to WORK on that. I would call it REASON why again. Maybe the person who’s lacking motivation is trapped, too. Trapped. For example. Nag hook na sya ng Basketball. Di na maiwasan talaga. Pag may game. Have to watch. Di matiis. So no motivation to study Virtual Careers. Pwede rin trapped by Iflix or TV serye. Pwede rin trapped kasi ang sarap na ng employment buhay. Sanay na. Db? No need to change. Complaining really helps remove the burden daw eh. So they are trapped with friends who drink and complain with them. Pare-pareho naman sila (specially sa BARKO) so why change? I think the best answer could be PRAYER, yes? You pray if you lack motivation. I don’t mean OUR FATHER. I mean -that 500x like sa rosary. On your knees . w/o sleeping…in quiapo or sa loob ng MAINIT at maingay na ENGINE ROOM ng CARGO HAULER sa gitna ng Indian Ocean. That would help. Sabi nga ng mentors –get the assistance of the SUPERNATURAL by talking to them. Praying constantly. Asking for help from them CONSTANTLY. You have living mentors here. You have books here. But the super natural, we forget most of the time. 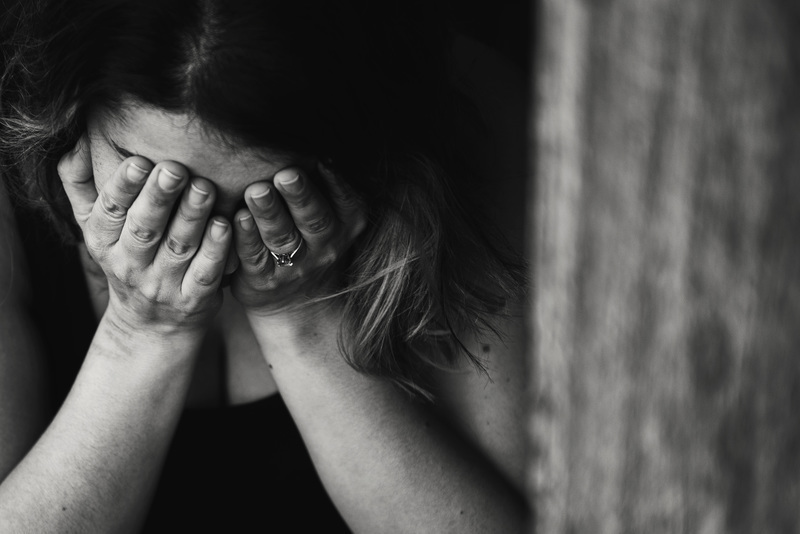 At home when the mood is bad and prayer is scheduled (TAKE NOTE, scheduled po) – we still sing and pray . Even for a very short 30 seconds. BASTA consistent lang. 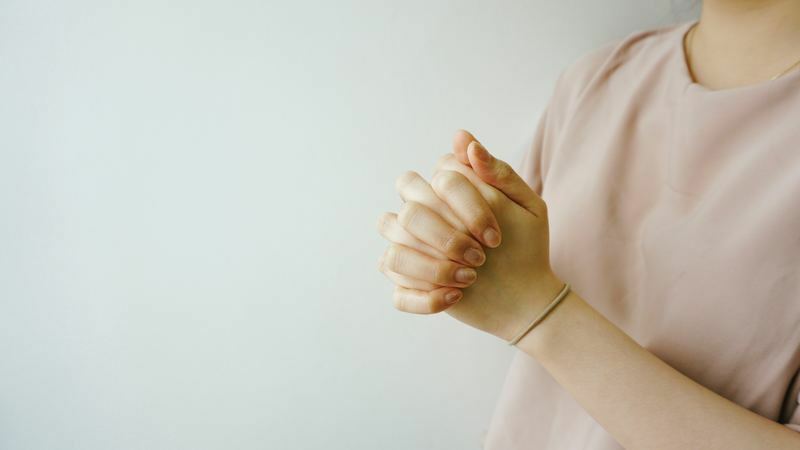 I think regular prayer or meditation (if you’re not a be-beiber, hehe) can help you TAP that POWER that God left in the earth when Jesus said “I WILL GIVE YOU A HELPER!” Pentecost! Tap into THAT helper and MIRACLES and OPPORTUNITIES will come and come and things will FALL INTO PLACE. Why? because you walking around JERICHO for 7x in 7 days (meaning: praying consistently w/o any hope in sight) will GIVE YOU RESULTS (Your enemies LOSE beyond reason, you should have lost but THEY LOST). Read Bible: 1 Sam- 2 Samuel for more details. PS. See the rest of the answers from the group: “What did you do to get MOTIVATION?”. P.S. SEAFARERS and OFWs Trapped in your work: Join us as we interview Kristine, a SeaFarer who has escaped the boattrap – and is now living at home and working using only her computer. 9pm at fb.com/jomarhilario, TODAY. I figured out that if you LOVE TO WRITE you should be writing “Marketing Copy”. That’s the stuff you would find in advertisements. Used as a script in a Youtube Video or Youtube Ad. Used as a script in a Facebook Live presentation that lasts for 1 hour. Used as a poster in social media but not as one poster but as series of posters – leading up to the main message. Now. Between blogging and writing marketing copy, guess w/c ones earn more? 1. You don’t wait for visitors to visit a blog to earn. Your client pays you directly. Even if your work or writings haven’t even given him a single sale … YET. 2. Once the sales come in and you have a fab relationship with the client, the next thing you write can include a DEAL wherein your receive 10% of all sales UNTIL YOU BOTH GROW OLD. That’s the power of writing marketing copy. Thing is, you know how to write, right? Do you know ANYONE who’s had 10+ years of experience in writing marketing copy to guide you, monthly as you grow in this craft and trade? There are tons of dead authors with 20-30 years of copywriting experience who can guide you. Using their works and books of course. Unfortunately, they can’t give you LIVE feedback. Unfortunately, many of the copywriting greats have NOT written books. They have marketing copy but they don’t teach their methods AT ALL. SO WOULDN’T IT BE GREAT IF…. Someone with 10+ years doing this “Writing Marketing Copy” would help you out? Wouldn’t it be great if this person not just WROTE but also MADE SALES with his “marketing copy?”. I mean, it’s one thing to WRITE GREAT COPY that wins awards and praise, yes? Just ask the writers of the SUPERBOWL ads – they’re in it for the GLAMOUR of being featured in the Superbowl (Big ad & sports event in the US where I binge watch EACH AD that comes out every year, hint! hint! hint!). In the Superbowl ads, there are excellently written marketing copy and horrible ones too. But get this, a massive percentage of those ads were written by employee copywriters. Is that the mentor that you want? Plus, they’re NOT TEACHING WHAT THEY KNOW. I believe an employee or even VA copywriters can help you if they are willing to help, yes? But wouldn’t it be great if your “Marketing Copy” Mentor wrote and made money for SOMEONE ELSE and wrote and made money for HIMSELF, too? YOU SEE WRITING FOR SOMEONE HAS NO RISK. You write for someone’s product, it makes little sales. You don’t get affected as much. But if you write for YOUR PRODUCT, YOUR SERVICE, YOUR LIVE EVENT, and it makes a small impact — you quickly LEARN to adapt and adjust. Now multiply that with 13 years of writing marketing copy and testing it in the market live and what do you have? You get A UNIQUE PERSPECTIVE that you can’t get from watching all the Copywriting tutorials inside youtube and MOOC sites. Would you like to have access to that UNIQUENESS? Wouldn’t it be great if your copywriting teacher is skilled & trained in the art & science of ADULT LEARNING? Like for example, wouldn’t it be great if your teacher has an “APPLE.com TEACHER” certification? Best of all, wouldn’t it be great if your copywriting instructor taught thousands of students before you and have recorded victories in their lives as a VAs not just in copywriting but in other (more difficult) fields as well? WOULDN’T IT BE GREAT IF THIS TEACHER WOULD BE WILLING TO TEACH YOU COPYWRITING EVERY MONTH for AS LONG as need it? Three years ago, I’ve formed teams inside my Online Mentoring Club (OMC) -and they had banded together to create SINGLE NICHE WEBSITES. One of them was the GO GREEN PINAS. BTW, its website is still working. Each team contains around TEN members. The Online Mentoring Club teams meet using the internet. The group GO GREEN PINAS even did a Karaoke Night one time – so it was not all technology and marketing, it was also a great way to be a part of like-minded teams with a single goal. The goal – if you chose to accept it – was to SEE WITH YOUR OWN EYES – that you can earn money/cash from the internet with your TEAM with you. 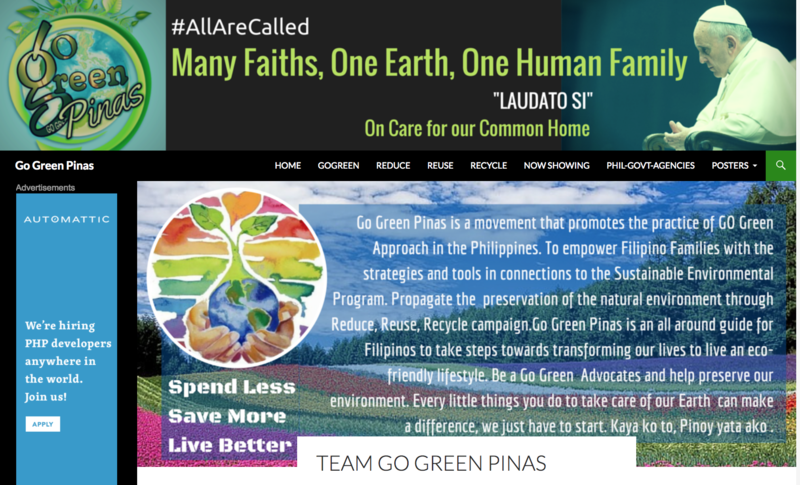 Last Monday, I had the chance to interview one of the Go Green Pinas team members. Crestine Carson shared her journey from 2014 when she joined OMC, took FB ads course until she built her own Shake business. She’s a successful entrepreneur now. She will be one of the speakers at the upcoming Wealth Summit by Bro Bo. Crestine continues her online marketing journey with her new project – an ebook to serve nurses. She is also a nurse by profession. Do you want to learn from her story? How about you? Who’s with you on your journey? Never underestimate the power of a TEAM. They all need a team. I formed my own team (I hired & trained them) – when I began. You can do the same, but it does take a long long long time to do it. 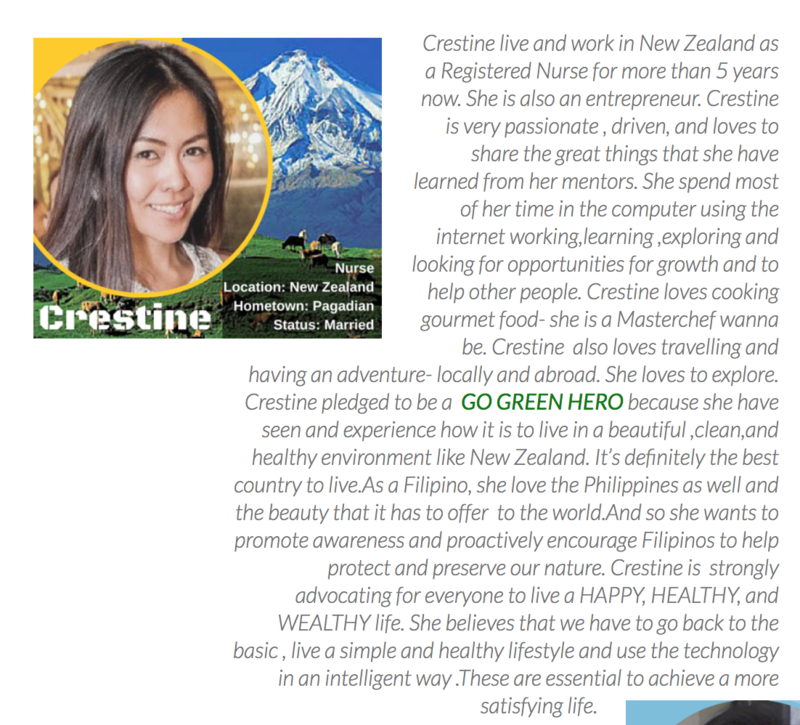 Crestine started in 2014, with the Go Green Pinas team, with the OMC, with her Truly Rich Club family. Don’t forget: It’s important that you belong to a group/team with both mindset and skills lessons to offer. Baka magulat ka, kasi you might not need this book anymore. I’ve been a virtual professional for 5 years now kaya nagdalawang isip ako if I should buy this. I just did my 2017 acctg and I am consistently getting $2,000 – 3,000/Month. I’m ok with my income but working 10-12 hours a day caused burn out. So I bought this book because I heard that Sir Jomar’s students charge higher rates/hour. Therefore getting the income they want working less hours. I wanted to know how they were able to do it. I found out how (and why they are able to charge high) in this book. benefits of a virtual career. I skimmed through this part. It’s not relevant to me. But for those starting out, I think this is a great way to find out if the benefits are actually things you would like. For example, the benefit of being at home all the time. Benefit ba tlga yun sayo? Hindi ka ba mabobore? The stories here are true-to-life stories ha, kaya makikita mo tlga anong life ng VP. Next, maraming practical tips on how to make your VP life easier. Gaya ng workstation ergonomics. These tips like wireless keyboard, etc. are very helpful! Actually when I was reading through this chapter, I realized I’ve already done almost everything he recommended! But I learned the hard way, years of experience. Kung nabasa ko lang ito before I started eh di sana I didn’t have to suffer months of painful wrists & neck before realizing I needed to adjust my workstation. Now onto the meaty part. The most important part of the book is the step by step Preparation on how to get a virtual career. Very practical. Ito tlga na experience ko sa world of online work. Things like “the format given in most exclusive schools will not work” True! Not one of my clients asked which school I graduated from or any of the usual things HR personnel look at in your resume. The one-sheet resume format in this book is the best format I’ve seen. It’s all laid out here – step by step – what you need to do before you even apply. I understand now why Sir Jomar’s students have high success rates and can charge higher rates. This book also gives VP career path guidance. Discussed are VP specializations that are high-value and suitable to your personality. Now this is the part na pinagsisisihan ko. I should have read this when I was starting out because it contained the types of VP work with high pay. Tapos based pa sa DISC test results mo. If I knew then what I know now, I could have started off in the right place/specialization. Mas maganda sana naging takbo ng past 5 years ko, db? Im guessing around 75% of the contents of the book you can learn on your own. But it’ll take years, working as a VP. Kung gusto mo mag trial and error sa career path mo, pwede nman. However this is the book to get if you like shortcuts from someone who has already gone through the path you want to take. 1. Newbie – Newbie meaning you have zero online client experience. YES, buy this. You need it. I repeat: You need this. 2. 1 to 5 years experience – NO, it’s not necessary. But if you want to charge higher rates.. get it. 3. 10 years experience – NO. Move on to getting a course, not this book. Shell is officially a participant in our newest contest. What will you win if you join? If you’ve read the book and you are eligible to leave a review on Amazon (spend at least 50 USD in Amazon even not for this book), then join our newest contest. All you have to do is leave a book review using your own words – what you thought about it. We’ll give you until March 10 to read and review. To enter, just go to https://virtualcareersbook.com/amazon -and leave your review there! 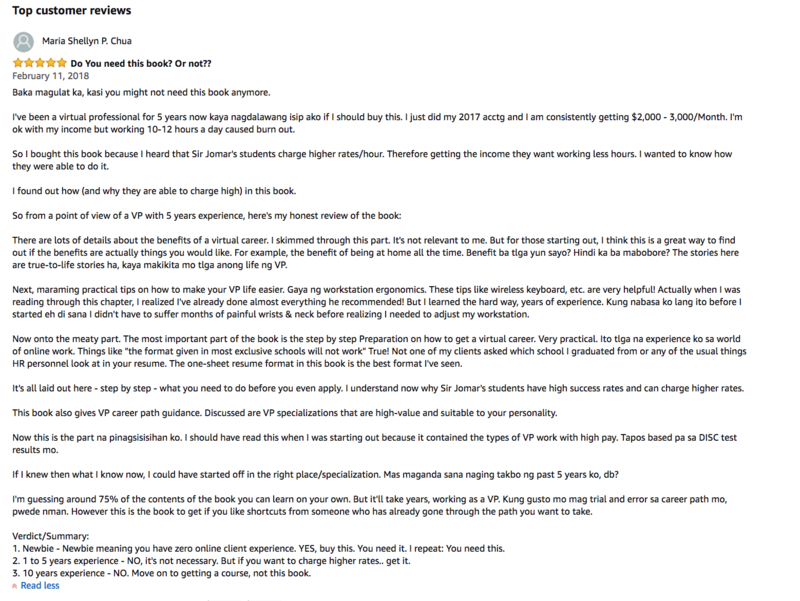 Note: Your review must be in WORDS, not just STARS (4 stars etc). Note: Your review must contain more than 1 sentence. Note: You do not have to buy the book on Amazon. Just leave a review! P.S. You can be the next Ana Olar, become a contest winner and change your life too. Leave your book review here https://virtualcareersbook.com/amazon. This is for all the men out there. Charlene is married to Aga. Charlene once said “Thank you Aga for surprising me always…..”. Are you the master of big surprises? Maybe yes..you like to think so. Ask the person you always surprise. Wait for their “Yes” or silence. Are you really that great at giving surprises…. specially during holidays? Reply to this email if you want! Psychologist reveal we all believe we are above average…at anything. Sad that in reality..I’m not. Because in relationships –surprises are just spice. What’s essential is … wait for it….. Discuss Valentine’s things this way…. You would do well to practice this as this is just a sample of all DECISIONS you do together in life. What trumps everything is a listening ear. 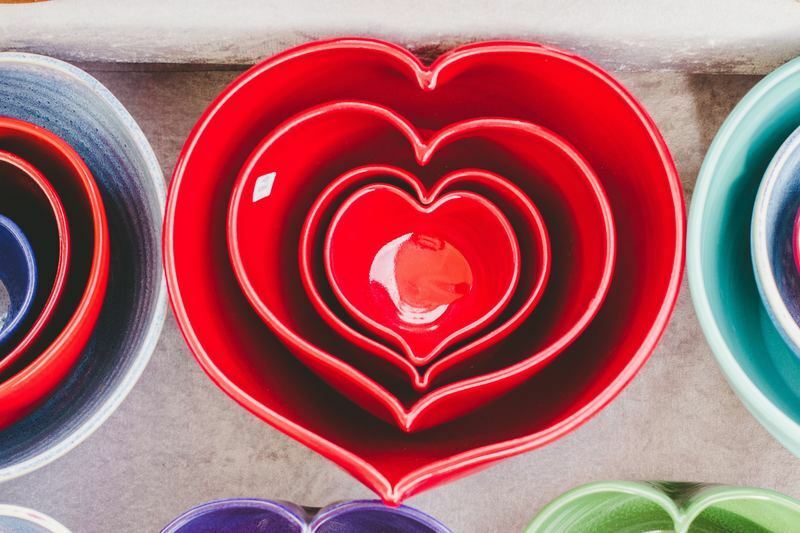 A loving heart that may or may not plan that surprise party. Happy Valentine’s and dont forget to get the ash…..! This is for all those in XMAS bundles, your bonus is here! See you next week! It’s going to be great and educational! Q: why decrease the price of IG Marketing? Q1: Curious lang ako why decrease the price of IG Marketing? It’s called “being generous” – especially those na walang DATE!!!!! (!!!) and allowing other people to join- in – at the last minute. 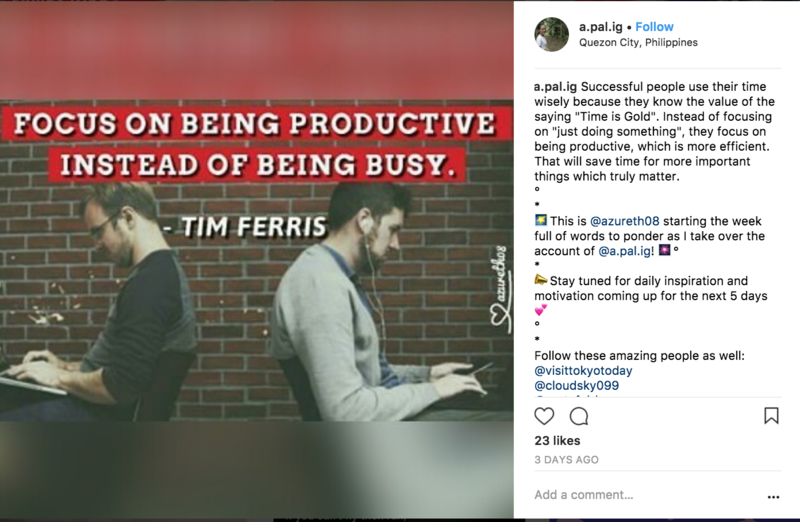 Q2: Instagram Marketing Course, how does it work with the 20-30 days training? A: The 20 – 30 days starts on Feb 15, inside Instagram. Then you’ll follow a special account I made for batch5. Every day, you’ll view the “Story” I create for that day. I post randomly throughout the day. You have 24 hours / daily =to see all and anything I post. What I post are questions, instructions, step by step, videos and photos. You install new apps on your smartphone (no computers, just smartphones are required). 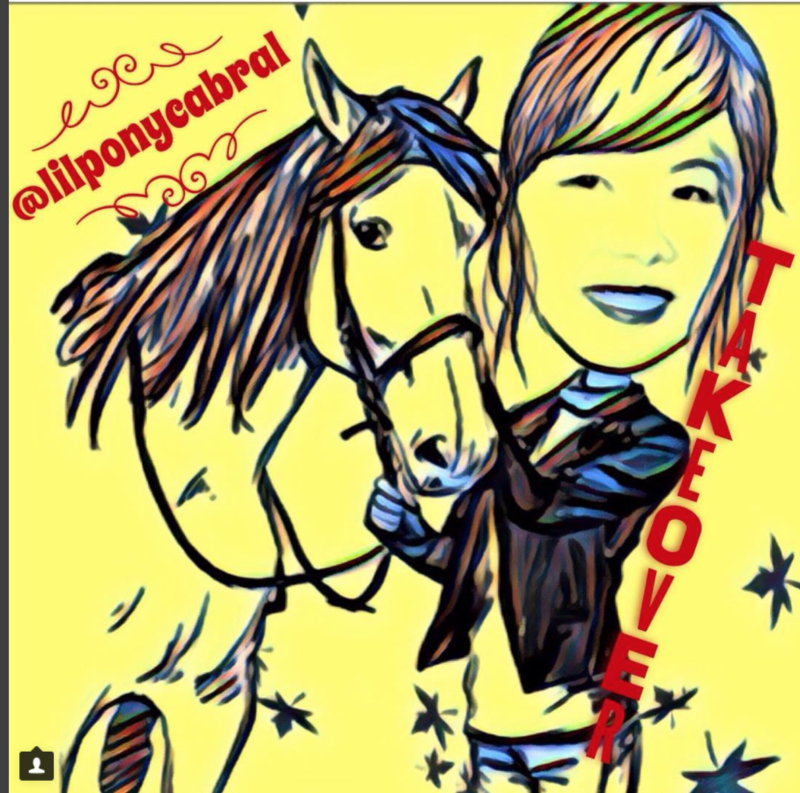 I teach you how to use the apps using Instagram Stories (w/c are like mini-videos with photos). 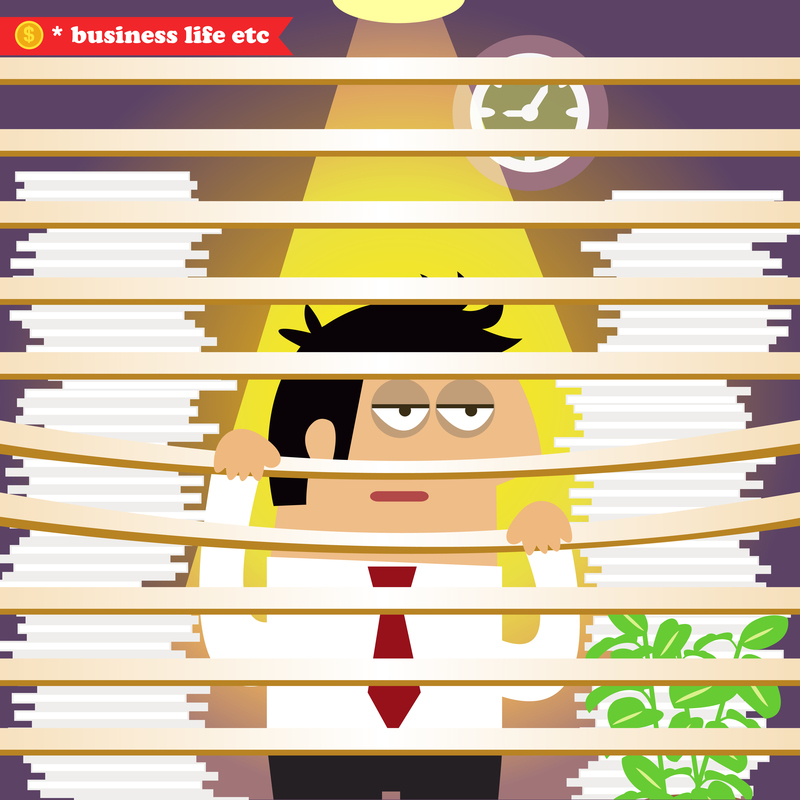 20 Working days but there are also weekends – on weekends -we take a break-ish. Ish because there’s ONE THING to do on SAT/SUN. You’ll know inside the course. After teaching nearly 500 people how to do this, this process simply works! You learn Instagram stories as a tool to market Ig businesses inside IG. You experience and understand first hand why it’s so effective for retaining and getting new clients. 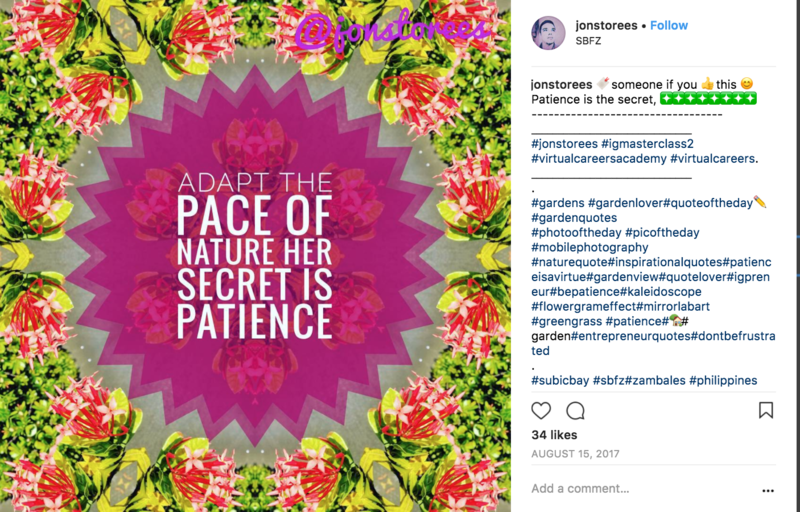 Your ig account followers will grow – proof that you can do this for other clients. You will also get to know potential clients in the course, and get to know your classmates, too. It’s now only P 4,000 per seat! Enjoy your Valentine’s treat, 3 days only. This offer is good until Feb 15 only. Q3: What’s the difference po of this full payment P4,000 IG course with the full payment P6,219 Xmas Bundle #2 IG course I paid for last Dec? 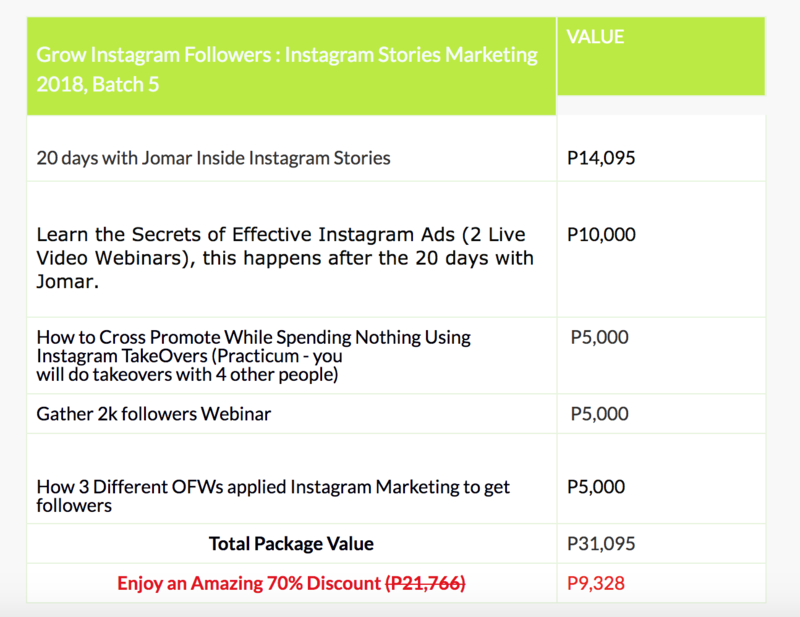 Grow Instagram Followers (Batch5) (P4000 today until Feb 15 only) is not a bundle. This is the PURE COURSE alone. But the course is a GEM. 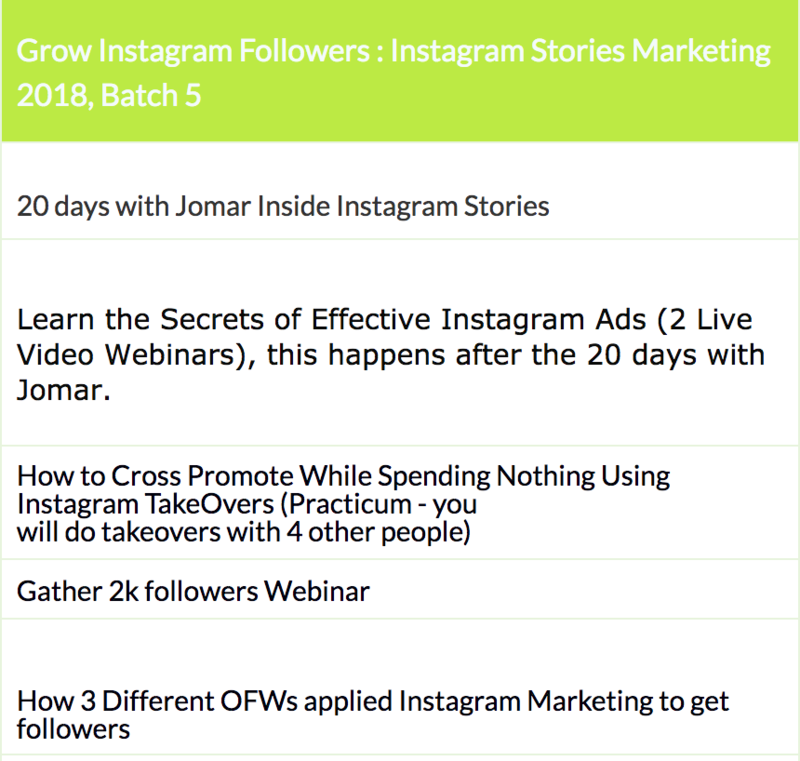 This a 20-30 days course with Jomar – inside Instagram. What’s inside? Read my answer to Q2. P.S. Remember this is a TIME-SENSITIVE OFFER. I can only *guarantee* you’ll get this course and reduced price of only P4000 (or 1500 x 3 months ) if you enroll by Feb 15. Here are sample sections/pages of the Virtual Careers book – in case you haven’t read it. 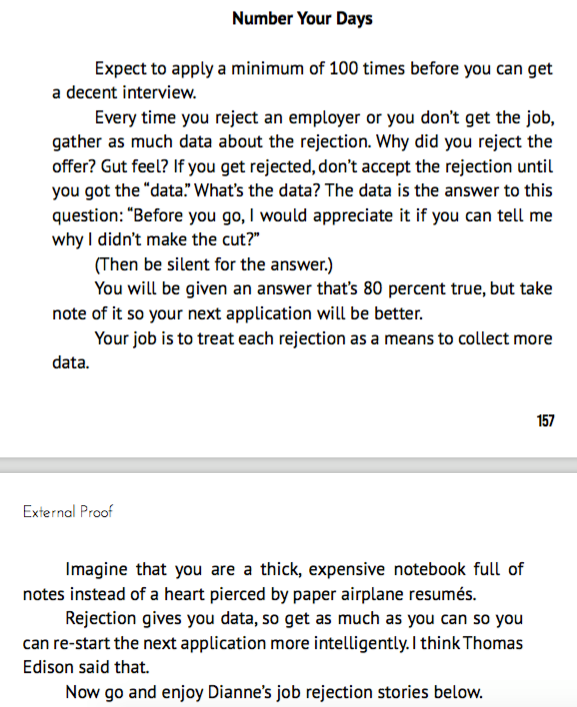 How to Treat Rejection when Being Interviewed by a Client. b) review -using your own words – what you thought about it. We’ll give you ONE MONTH to read and review. P.S. 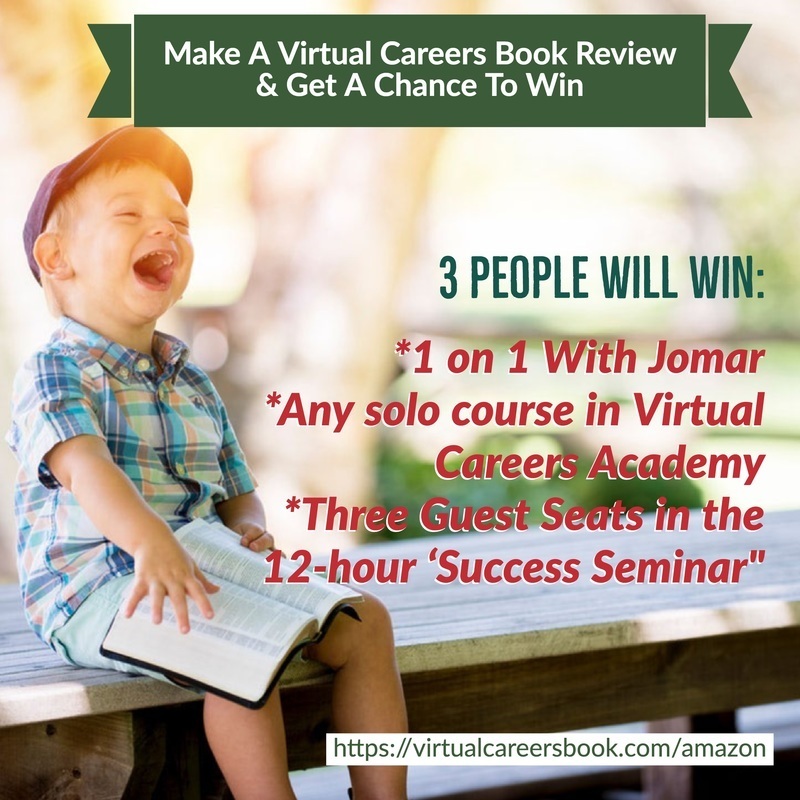 Just leave a review on https://virtualcareersbook.com/amazon and be the next contest winner! 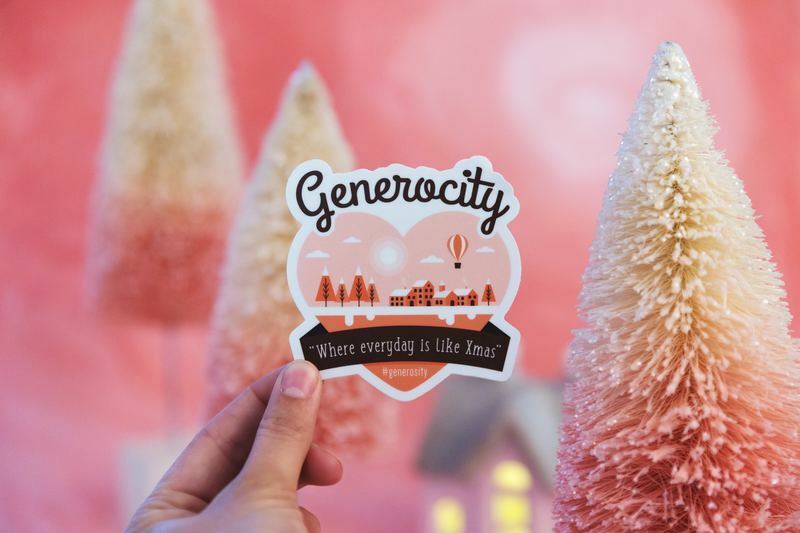 When someone becomes generous, how do you feel? Do you regret it if someone is generous to you? Because it’s VALENTINE’S SEASON …I’d like to give you MANY DATES. And not just for one day. Then join the Instagram Stories Marketing Online Class Batch 5. We start on the Loveliest of dates: FEB 15. And continue everyday until MAR 15. We have a new installment and a new low price. Mind you – ii’s not a bundle. 20-30 days with Jomar – inside instagram. You will gain friends and followers ALIKE. Plus there’s a ton of surprises at the END – that NOBODY HAS EXPERIENCED BEFORE. Yes, we have new stuff coming in the IG Course. Stuff that has not been seen before. This new material is not in the IG updates by Facebook. But you have to join to find out what it is. We’re starting in 3 days. about DATES (20-30 days with IG Batch 5). This FLASH SALE is available until Feb 15 only. P.S. Remember this is a TIME-SENSITIVE OFFER. I can only *guarantee* you’ll get this smartphone-based course and reduced price of only P4000 (or 1500 x 3 months ) if you enroll by Feb 15. Have to wait for someone to come home to send it to them? Now, you can do that! 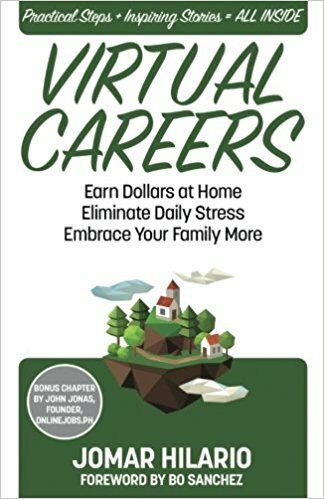 Virtual Careers is now available on AMAZON for delivery worldwide! The Amazon Book entry is brand new. So we’re going to need REVIEWS, yes? To encourage you to give reviews, we’re running a contest. Like that. Or just type in from your heart. Note: You do not have to buy the Virtual Careers book on Amazon. BUT, you must have spent at least 50USD on Amazon to be able to leave a review. 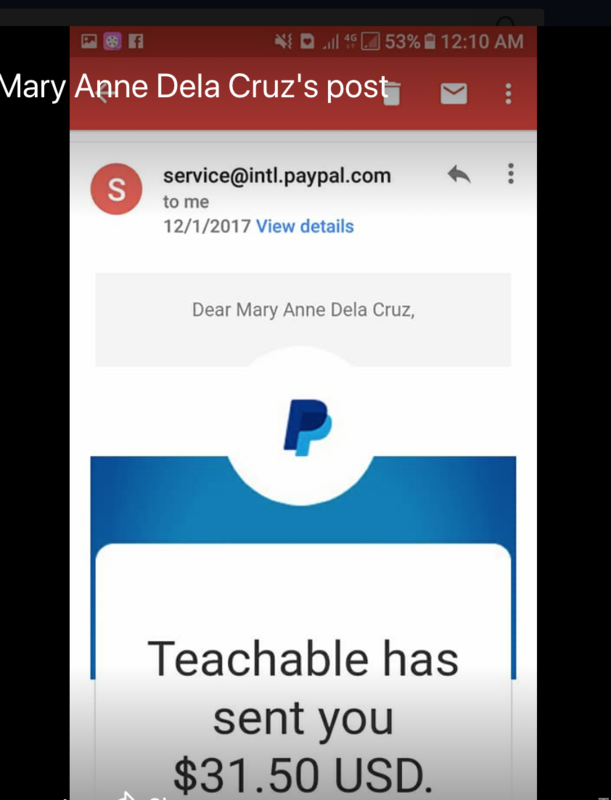 Below are proofs of a’ffiliate inc’ome of Mary Anne. She’s a teacher and a student of Instagram Marketing Masterclass. The affiliate fees she earned are her side incomes, what’s more important here, is the skill she used to earn those. 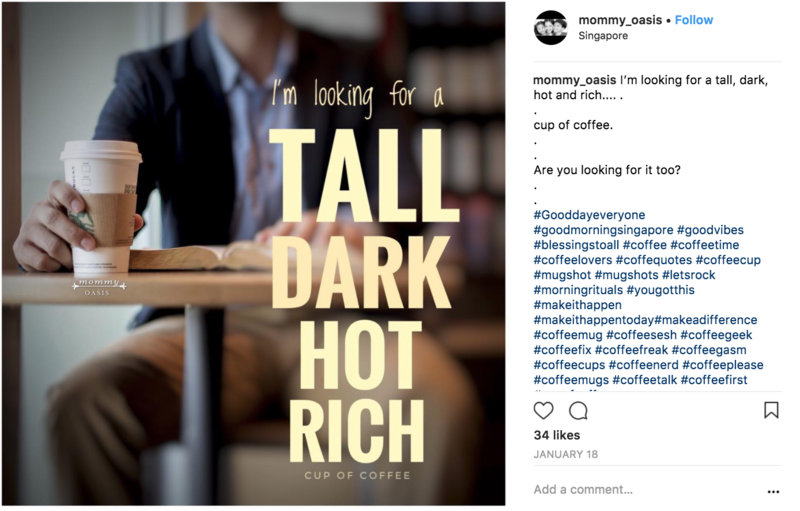 The Instagram Stories Marketing skill that she also offers to clients. The skill that makes her earn using just a smartphone. Want to learn the same skill and use it to earn? I will always be grateful of JomarHilario. Sunud -sunod na buwan ha?! P.S. And sana nag enrol ka sa Instagram Masterclass. I have a client. Work lang ako gamit phone. May discovery Call uli ako sa Linggo naman. mag enrol ka na kasi sa Instagram masterclass. The mindset and Marketing Tactics are worth it. PS3 Thanks again Jomar for everything wink! wink! PS4 Ang nakikita nyo sa mga larawan ay resulta ng combo application ng courses ni Jomar. 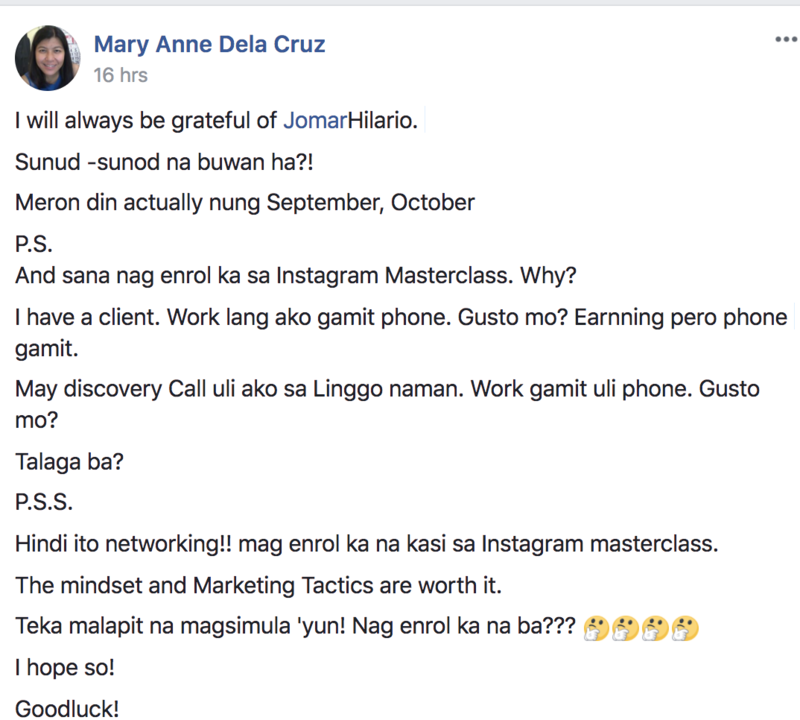 Nabawi ko na lahat ng Instagram Courses ko 🤣 at may sukli pa.
Namamahalan ka ba sa courses ni Jomar? Do you want to be like her? Earn income using just your smartphone? Decide now because we will start Instagram Stories Marketing Batch 5 on Feb 15. P.S. Make sure you’re in before February 15 so that you will not miss the fun and the lessons. Batch 5 na! Magpapaiwan ka pa ba? You must first interview a potential client. Here’s how you can do it. It’s 2018, and getting clients has never been more important than it is today. And as a newbie or someone who’s still looking for a client, you must learn this technique many sales professionals are doing to get clients. They call this the “Discovery Call”. So, in yesterday’s episode of Ideas.Prosper FB live, we discussed why your first client interview should be a Discovery call. The Discovery Call strategy works even if you think you don’t have enough experience. With that, I’m proud to present to you my tips on how you can apply it in your virtual career. Click here to watch the video and get the rest of the tips. * What questions you should ask in a discovery call. * How to present yourself during an interview without trying hard to look like an expert (you don’t need to if you’re not!). * What should always go at the end of your interview. It’s been fun sharing ideas like these with the Xmas Bundles/Singles fast movers this past couple of months. What happened during the FREE 1on1 coaching? Read below and maybe, you can learn a couple of things too! I hope they help you as much as they’ve helped Heidi, Jesse and the other mentees. They’re very generous to share what they’ve learned. See below. 1. I LEARNED THAT TIME IS ONE OF MY GREATEST RESOURCES IN THIS JOURNEY. Use it wisely! 2. I also learned that after a mentoring session, it is best to reflect and write down what you learned RIGHT AFTER the session because it is easier to recall as it is still fresh in your mind. Application? This is it (haha!). 3. It was interesting to learn a little bit about the technical aspect of a video conference too: that GOOD lighting makes a lot of difference on how you appear at the other end; plus a good quality webcam to seal the deal (naks, interview lang!). I’ll visit the local store for some LED goodness. 4. Having a set of prepared questions helped me get through with my one on one with sir Jomar. Oh diba, hindi ako naubusan ng sasabihin sir . Lesson? Be prepared…while still being natural. 5. This learning session also revealed to me that it is a good thing to follow up with your mentors as they are actually capable of forgetting too. ( ^_^) Follow up in a polite manner of course. 6. Another learning is that I can still tap into the previous IVS’s to gain more confidence. But first, finish the courses that I have. Too many courses, and it feels overwhelming na. 9. Validation of feelings is also very important for someone who’s just starting his climb (that’s me!). Thank you for the inspiration sir Jomar. 10. Lastly, we go back to TIME. To those who want to but are still undecided whether they should pursue a virtual career, I highly highly highly suggest that you take action NOW. Technology is more rapidly changing than it was 5 years ago, so we all have a lot of catching up to do. Face where you want to go. Then GO! 1. That making a CHECKLIST with a DUE DATE and PLACING it where I can see it always will help me keep track and make progress as a VP. 2. 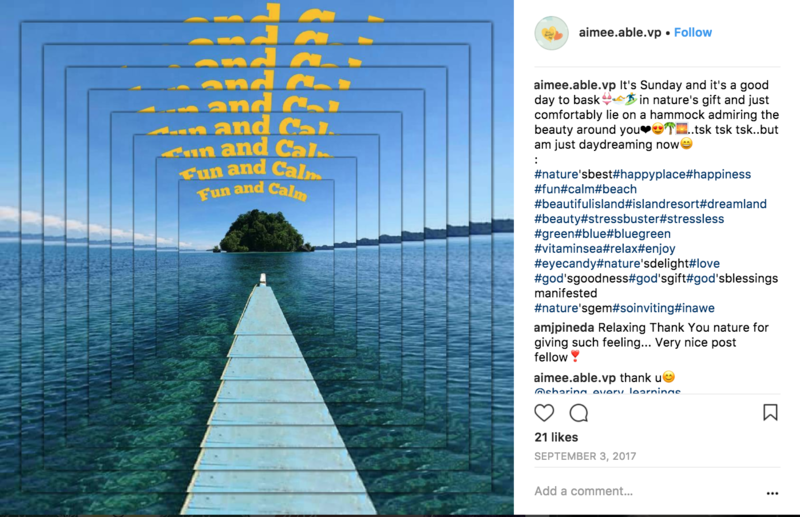 That it is important to select a niche (not just one but five niche) on IG with 10k or less followers so that the efforts I’ve exerted in making IG post will be visible to more IGers. This will also help increase my IG followers. 3. That if I apply the 30 hashtag rules correctly on IG then I can increase my followers. It should be rule#1 MAIN TOPIC, rule#2 BRAND NAME is about the client’s name, the client’s name on IG, services offered and known products of the client, rule#3 SPECIFIC TOPIC, rule#4 SPECIFIC LOCATION – target market of the client and rule#5 GENERAL LOCATION – where the client’s business is located. 4. That I have to tag 5 different people daily on IG who are NOT my friends to make myself visible and again get more followers. 5. That if I practice the 30 hashtag rules on IG and is posting consistently then I can use it to help potential client increase their followers and possibly get hired as a VP. 6. That making tutorials is not just about having something to present on my portfolio BUT it is about something that I will enjoy doing when serving my future clients. 7. That there are apps for high C personality like me that I can start working on for my tutorials such as Canva, Trello, pivot tables, SQL, MS Access, AB Testing, Kissmetrics, Mix Panel and Google Refine. 8. That the “The Aladdin Factor” by Jack Canfield is a must read book to know the right way of “ASKING” and to overcome self-limiting thoughts. 9. That I need to learn to “ASK”… ask others for help…to not become “SELFISH” para lahat “happy”. 10. That he CARES about me, my journey as a VP because he takes time to listen, shares his wisdom and give me reminders…not to limit me but rather to keep me from hurting myself as I pursue this path. Definitely this 1 on 1 coaching session with sir Jomar is PRICELESS! If you’ve been thinking about getting a Christmas Bundle/Single there’s still time to get in. But only until 11:59pm (Philippine time) of February 2, 2018. Not ready to decide? That’s fine too. Feel free to try it out for 30 days. If you feel like it’s not a great fit, I’ll refund 100% of your investment without a second thought. 1. Bundle 1 – 4 Courses for Newbies – Learn how to ea’rn from your ho’me with regular income. 2. 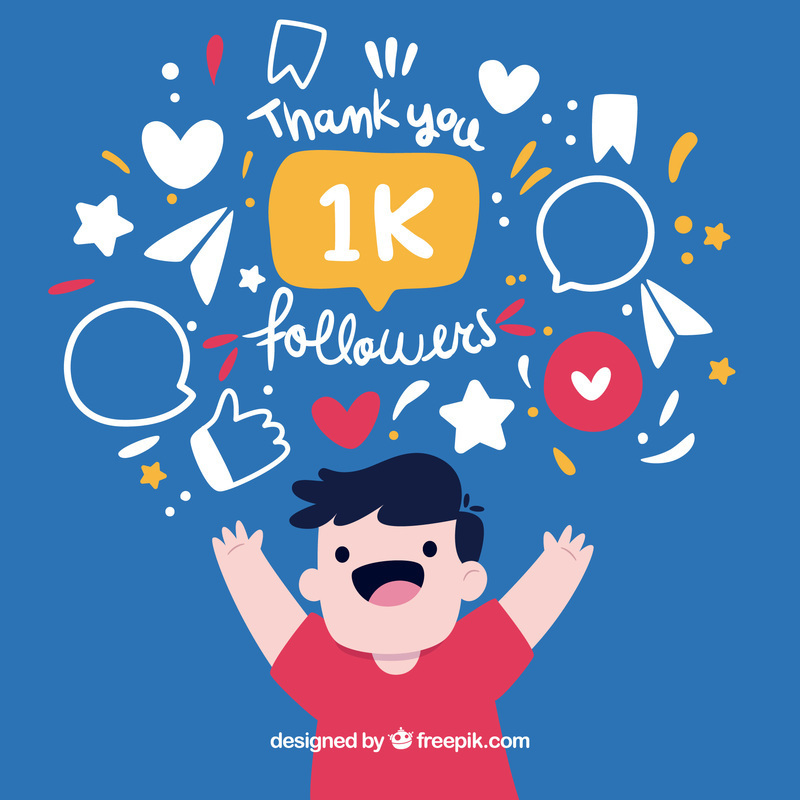 Bundle 2 – Grow Instagram Followers: Instagram Stories Marketing 2018, Batch 5 – Earn income using your mobile phones. Lessons will start on Instagram this coming Feb 15. Don’t miss out! 3. Bundle 3 – Facebook Marketing Bundle – Ultimate Virtual Skills That Will Help You Charge Up To $100/Hour Rate. 5.Bundle 5- Instant Virtual Skills 2018 Early Bird (Total 7 Months / 6 months with bonus 1 month) – Mobile Interactive Marketing Masterclasses (MIMM) Online Class. Learn the new skills that make you in-demand for 2018 plus all months include a copywriting lesson. 9pm. So hurry up so that you can join the very first session. 7.Bundle 7 – Instant Virtual Skills 2018 PLUS Well-Designed Success online. If you want bundle 5 (P20250) and bundle 6 (P17500), get this one because you’ll get more savings here, it’s only (P22,000)! What a steal! 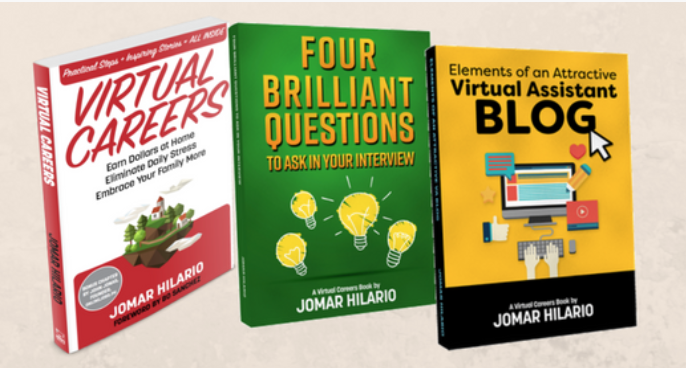 8.Bundle 8 – Ebooks From Jomar Hilario For Newbies And Experts Alike – P1200 only! 9. 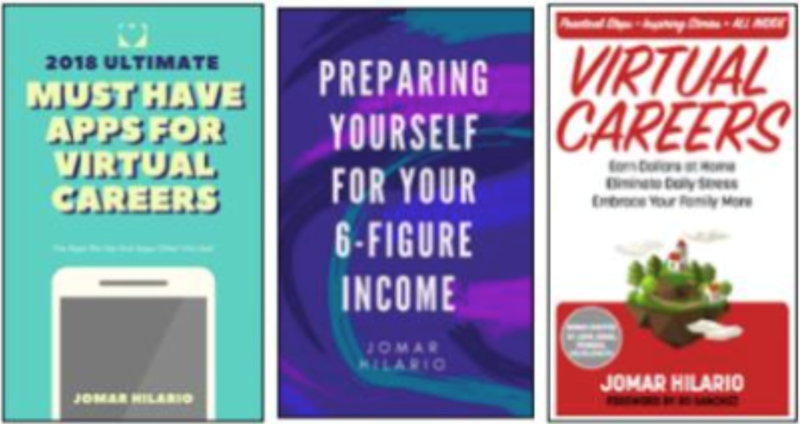 Bundle 9 – 2 New Physical Books – 2 options to get them in bundle 9! 1. Singles 1- Well-Designed Success Retreat – Join us in replanning your success in a whole day retreat in March 2018. ‘What if I wasn’t an alcoholic? What if I wasn’t an absent father all these years? And just like that he stopped drinking and started living. For some it takes ages to change, for some –its just a single moment – and suddenly his life turns around. It’s the day you turn your life around. Maybe it’s time you thought like him. And you can start the change today. PS: You only have one day left — to get the Xmas Bundles/Singles. Jomar is giving away a free Financial Market Investing Course and raffle prizes which include the fully-loaded Ipod Nano worth 18K. You MUST take this chance now and simply try it out. The risk is all on Jomar so you don’t have to worry about a thing. P.S. You can also pay via bank deposit, just follow the steps here https://virtualcareersbook.com/bank/. how is the schedule as a Virtual Professional? Since most of the clients are from the US, does it mean VPs also need to work in US time? In the book Virtual Careers (get it at https://virtualcareersbook.com/) there’s a sampling of different schedules. It’s all over the clock. Personally, I discourage working on anybody else’s timezone but your own preference. 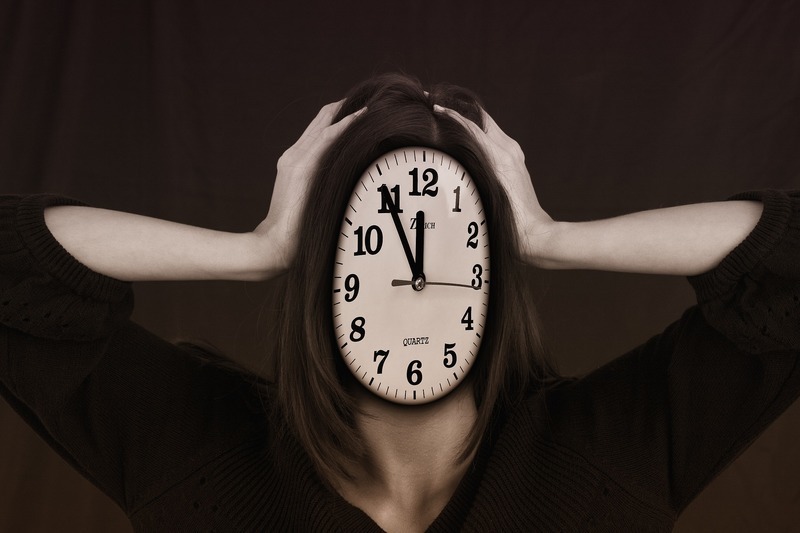 Say “I’m doing this VA thing to take control of my time, not to adjust to someone’s timezone. Or simply be quiet and select jobs that have no time in and out. But delivery dates. There are lots of those. Q: I found out that Im also a C dominant from the DICS test. How much would be the starting salary for professions in this category? I don’t mind starting from the basic salary sir, I just want to know if there is a continuous growth in this career. 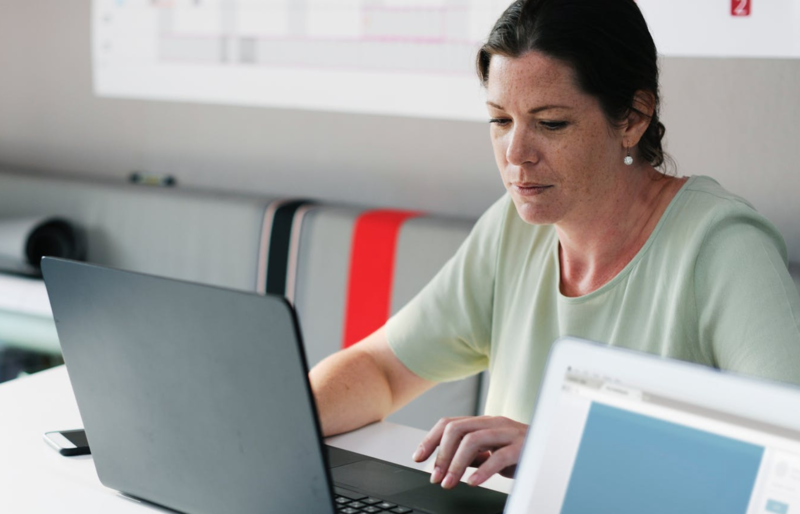 If you’re an EXCEL expert, check it out in Upwork and onlinejobs.com. If you’re a DATA SCIENTIST, you can command anything. If you’re neither all of that, then go get “C” skills. There are “C” skills in http://virtualcareersacademy.com/. I’ll be labeling them as SUCH on the poster. Q: I want to know more about What is really a Virtual Career is all about. There a lot of information you can google about Virtual Assistants or what we call here Virtual Careers. 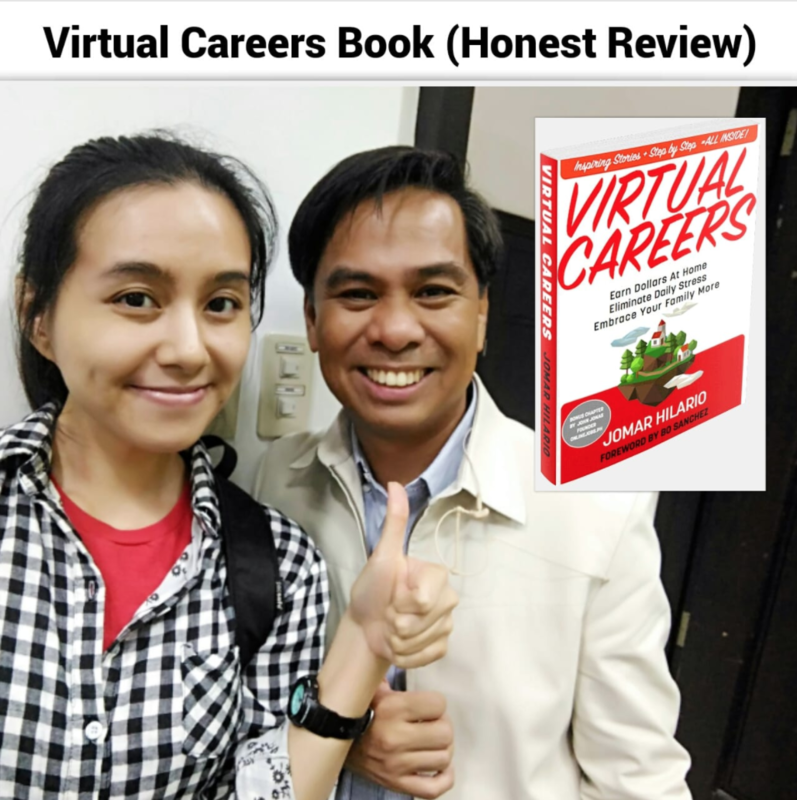 If you want to learn about it by seeing the interviews of real Filipino people (OFW, moms, private employees, etc) how they created a virtual career, you can find them here: https://virtualcareersacademy.com/courses/enrolled/124650. The most recent interview I had with a Virtual professional was last night. 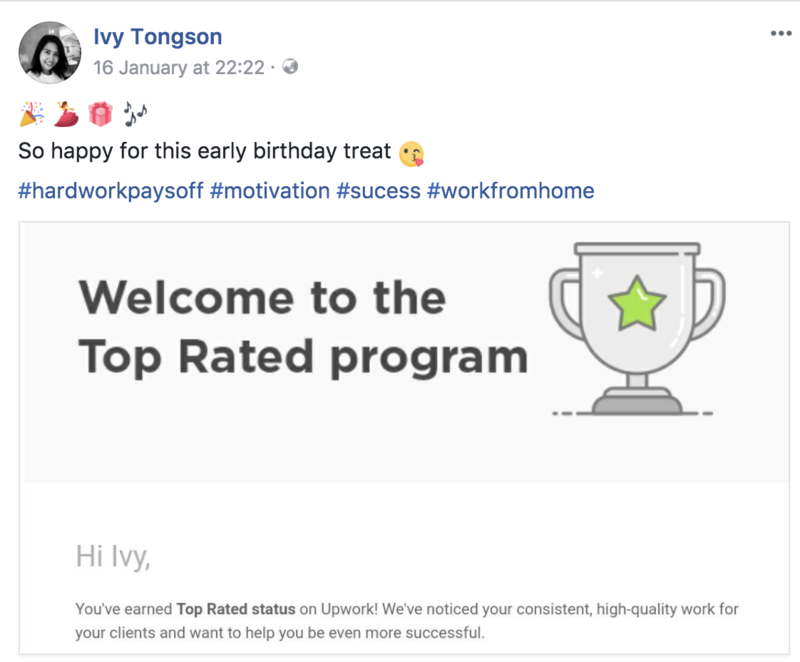 In that interview, Ivy Tongson revealed how did she become an Upwork Top Rate VA.
She’s working 10 hrs a week. Yes, virtual careers can be done part-time. The schedule can be flexible. > Use Snapchat (!!) another social network that will be the talk of the town in 2018. > Use Workflows of different apps to create unique posters, videos, and animations. > Impress their teenage family members with their skills in making social media posters while lying in bed. > Use all the features — and I mean ALL the features of Instagram plus Instagram Stories plus all the new updates this year. There’s more like Hashtag Research, Commenting like a human and tagging rules etc. Set your calendar/timer and execute. Get Christmas Bundle 2: Grow Instagram Followers: Instagram Stories Marketing 2018, Batch 5. ☛ New payment channel for Virtual Careers: Now you can pay through G-Cash if bank payment/credit card payment is not possible. We’ll be starting the lessons inside Instagram on Feb 15. You can still join Instagram Batch 5. 4 DAYS TO GO: Get All These For Only P 9328. You owe it to yourself to take full advantage of this time-limited, RISK-FREE offer before it’s too late, as I will be increasing the price after Feb 2, 2018. P.S. Hanggang February 2 na lang ang 70% discount sa Bundle 2: Grow Instagram Followers: Instagram Stories Marketing 2018, Batch 5. Take advantage of the current discounted rate http://jhilario.com/xmasinsta2017 now. A real look inside the coin market and simple tools you can use to understand it. Baby Simple Explanations of Blockchain – the technology running Crypto and what it’s a big bananas deal. 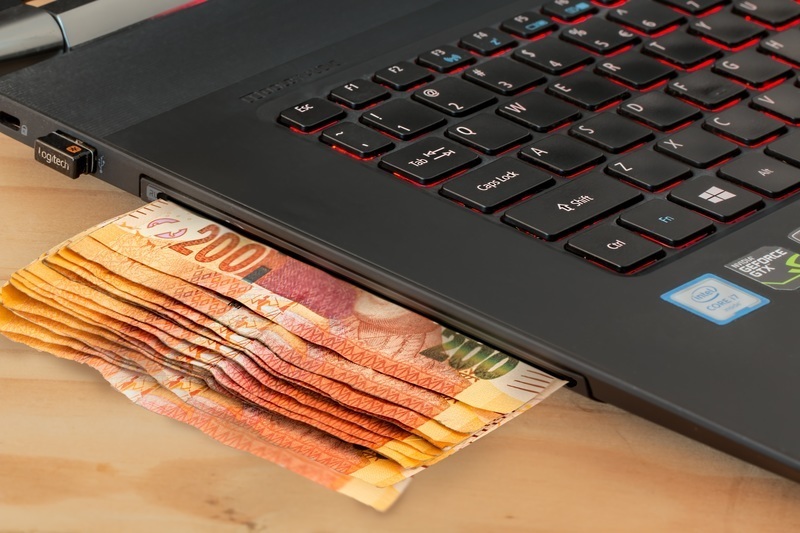 What scams are happening, now – who is earning and who is not? What you should be doing in Crypto (bitcoin? Trading? Alt-coins? ), STEP BY STEP. Introducing the Lounge Chair Relaxation Method of trading in the market. How I earned min 20% a year using this technique and how you can too. Should you do technical analysis or not or is it just a hologram of guesswork pretending to be real? 3. Both markets have dictionaries full of complicated words and jargon. And the “gurus” inside it seldom take time to explain themselves. How can you understand them all – without spinning like a top in confusion? You’ll discover a “shortcut through the park” to understand what will confuse you in the future -so you don’t feel like a yoyo-being pulled by their strings. **You can join us for only P 2,500 (That’s 50% off) or get in for free, just by getting any Xmas Bundle or other Singles. 2. Feb 17, 9pm. For Second Session. Online. P 2,500 for the 2 sessions. Value P 5,000, 50% off! Or just get any Xmas Bundle/Other Single and get it for FREE! P.S. MORE FINANCIAL EDUCATION = MORE ABUNDANCE for your family. Get Financial Market Investing Course for FREE if you get any Xmas Bundle/Other Single on or before Feb 2 only. Or get the 2 sessions of “Baby-Simple” Financial Markets Understanding & Investing Course for only P 2500 —LIMITED-TIME offer! 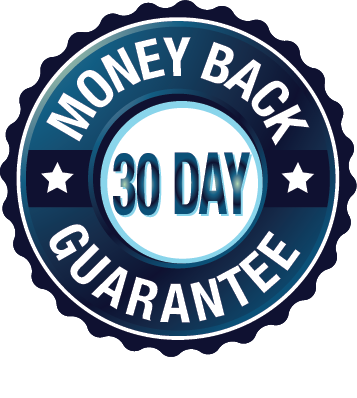 Yes, we have a 30-day money back guarantee! 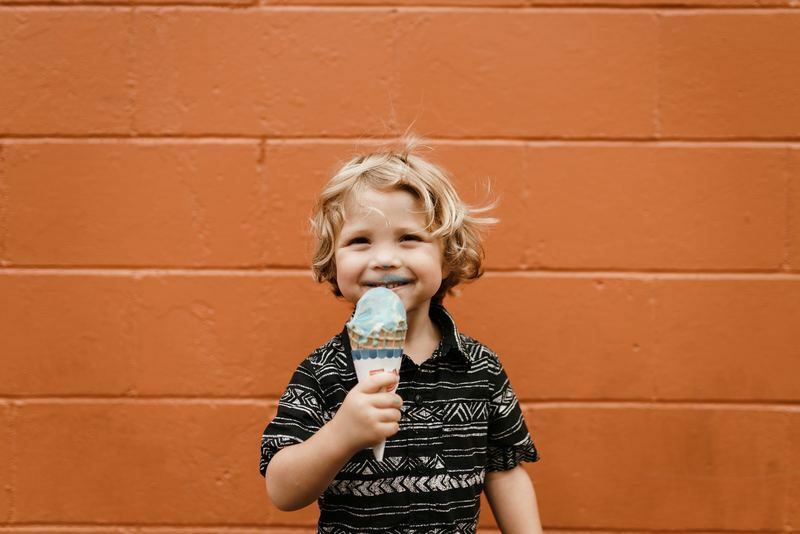 One of my students just earned Upwork Top Rated status! 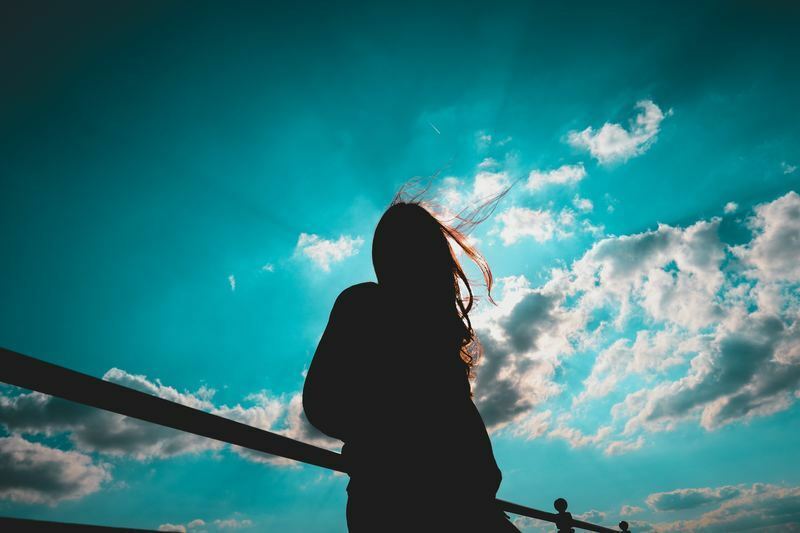 But get this – she started out sometime in the past and her consistency to pursue success has enabled her to reach this level of virtual career success. How about you? When will you start? I suggest you start with the Xmas Bundle 1: 4 Courses for Beginners Plus Printable Workbook. 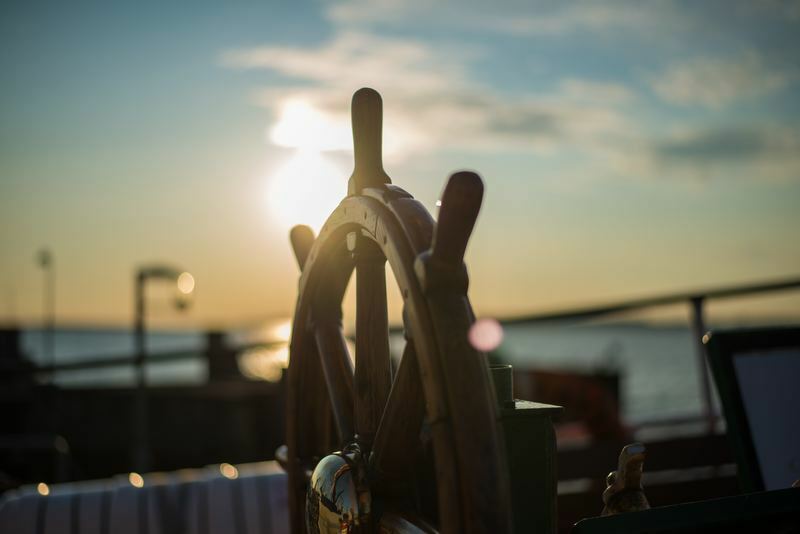 In the words of famous marketing author Seth Godin, “ship, now”. Now, I want to share this email from Ivy so that you’ll know how did she make it to the TOP. learn a lot from you. helped a lot because it showed my porftolio. direction of where I want to be career-wise. sharing all your knowledge to people like me. receive more blessings so you can continue to share it. P.S. You have until Feb 2 to avail of the discounted Xmas Bundle 1: 4 Courses for Beginners Plus Printable Workbook. Q: My goal is to earn P100,000/month as a VA. Please help me how to become a successful one. Earning 100K a month as a VA is possible. But you better be able to prove to clients that you know what you are talking about (before the interview) and your online skills are what they’re looking for. If you’re a beginner, I suggest, at least read the Virtual Careers Book and apply the lessons inside. Don’t just read and do nothing :). If you want a step-by-step and intensive training on how to start (downloadable version), then your option is to get Xmas Bundle 1: 4 Courses for Beginners Plus Printable Workbook. I say you get this if you want to get more value for your money because it is massively discounted until Feb 2 only. If you’re already earning as a VA/VP and you want to achieve 100K/mo milestone, then become more. That’s why I offer the Instant Virtual Skills (IVS 2018- Mobile Interactive Marketing Masterclasses). So that you can become more by learning skills you can offer. I want to emphasize that all months include refinement of your copywriting skill. 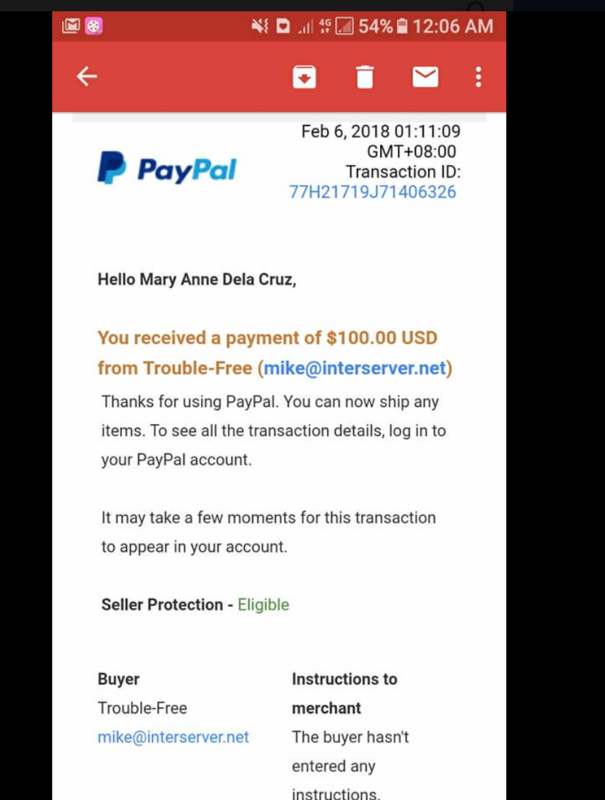 http://jhilario.com/paymentdetails so we will know that the payment is from you. Now you can pay through G-Cash if bank payment/credit card payment is not possible. More details about Bundle 5 here https://virtualcareersbook.com/2017xmasbundle5/. Q: DO YOU HAVE UPCOMING LIVE SEMINAR/WORKSHOP? A: As of today, the only sure LIVE seminar/workshop happening is this Saturday, Jan 27. All other masterclasses included in IVS 2018 are ONLINE. If you want to attend a live workshop and learn how to create blogposts for affiliate marketing, you can join for only P 3500. You can also do bank deposit to pay for this. P.S. You have until Feb 2 to avail of the early bird rate for Bundle 5: Instant Virtual Skills 2018 Early Bird (Total 7 Months / 6 months with bonus 1 month) – Mobile Interactive Marketing Masterclasses (MIMM) Online Class. 3. Learn directly from mentors who’ve done it many many times. You need to attend seminars and workshops and get into mentoring programs – online and live. The Xmas Bundle to create Online Store, Marketing Funnels with Copywriting Course (With 1on1 Mentoring with Jomar). Yes, that was a commercial. 4. Calendar your goal, your intention to sell online, your action steps to reach the goal. Activate the alarm and take action. If you still have time, watch this 4-minute video on How to think about niches and markets when you are starting in Digital Marketing. What if you can get up to 60% discount on those workshops, mentoring and coaching? 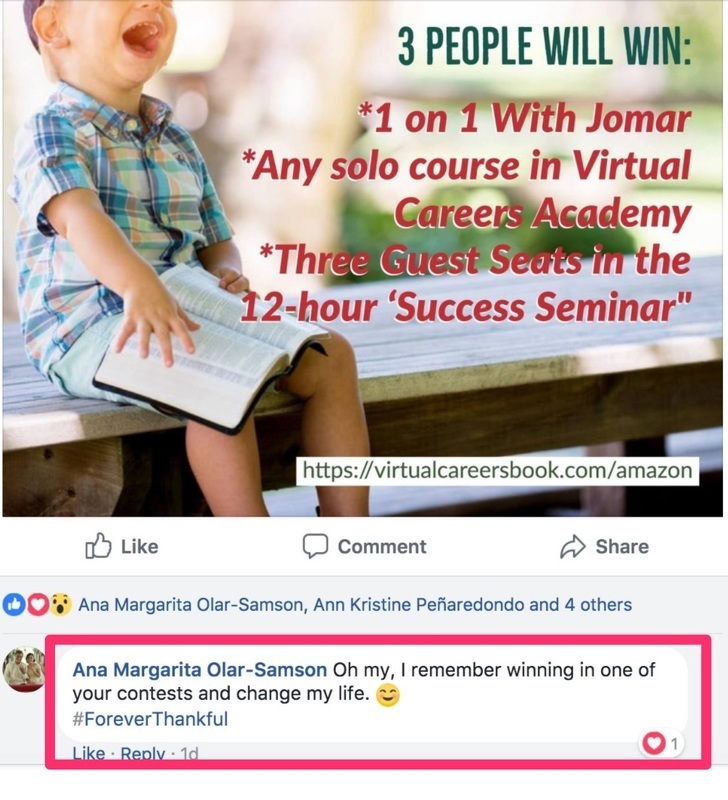 In my Facebook group called “Jomar Hilario Virtual Careers,” there are responsible, ambitious high achievers and there are plenty of irresponsible, complacent low achievers. The first often become permanent residents; the latter transients. The first comb this email for what they can use, decide how to use it – now. The latter leave this email – and waste it in their inbox. And so it is with everything that comes their way. The niche selection video urges you to take action. What’s stopping you to create that Instagram Business account for something that interests you the most? 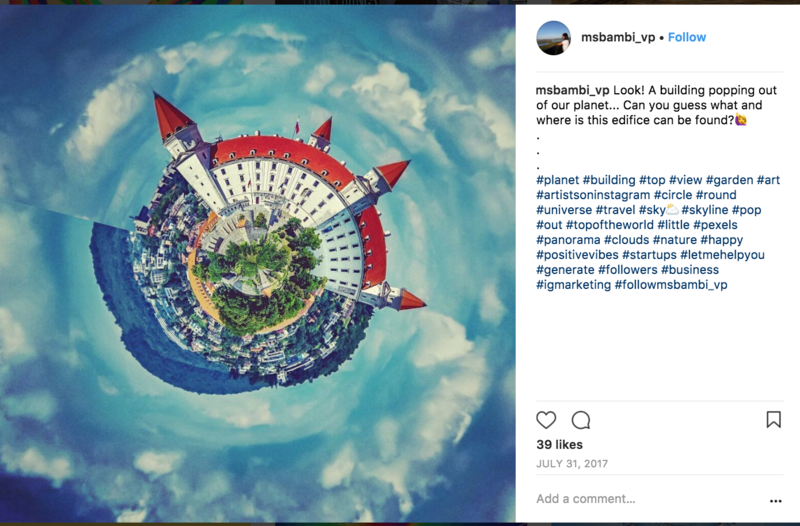 What’s stopping you to create posters (there are a lot of free apps to do this) and post them on your new Instagram business account? The first registered for my How to start virtual career workshop, IVS 2018 or Well-Designed Success Course/Retreat or the Online Store bundle- weeks ago, the latter “thinking about it”. Yes, that was a commercial – again! But don’t mistake it for something more – one of the best things about my life is that I have no need to care whether you are in the first or second groups. It’s entirely up to you, what you’re going to do with it. And by the time you read this – at least 5% of it will already be gone. Wait, be late, miss out. Yes, I did say, you can still get up to 60% discount. But this is not for forever. It’s up until Feb 2 only. Stop reading this email now. If you want to get the direct mentoring and coaching in selling online, Jomar is making himself available for you. How much is your investment fee? It’s incredibly low at P24,380 only! So if you’re serious about setting up an online store or at least wants to sell online, get Bundle 4 now. Monthly for 6 Months, you’ll meet me in a 1on1 discussion (online or face-to-face) regarding your niche preparation, product to sell, marketing. This is not a webinar, but an honest to goodness conversation between you and me. For “Starting from Nothing” to becoming an online seller/marketer. First 10 people get a one-on-one coaching with Jomar (yes this is on top of your 6-month coaching if you get bundle 4). Six people have already claimed their SPOT -so only 4 remain. Plus the 60% off is valid only until Feb 2 only. Again, wait. be late, miss out. Don’t be the one regretting it. Because the first group will be enjoying a MARVELLOUS LIFE this 2018…. Where to get Bundle 4? Please don’t take this opportunity lightly and let it slip through your fingers. P.S. 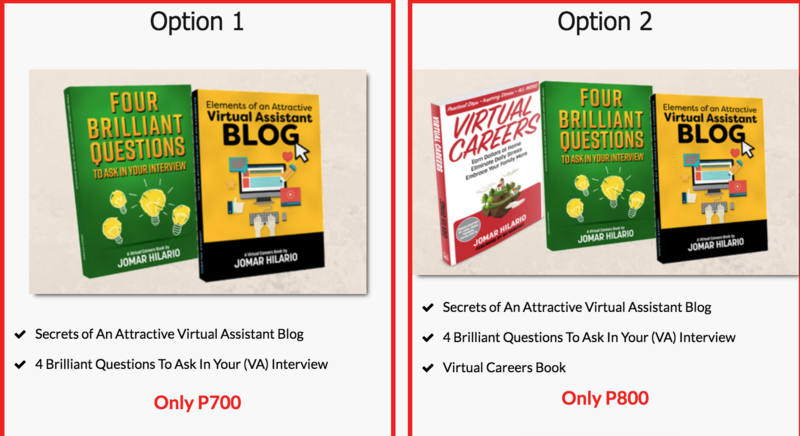 Go na: https://virtualcareersbook.com/2017xmasbundles/. Don’t be the one regretting it. P.S. If you leave this email without any action that will change you for the better, I guarantee someone else will… forcing you to live the life you don’t really want for the rest of your life. 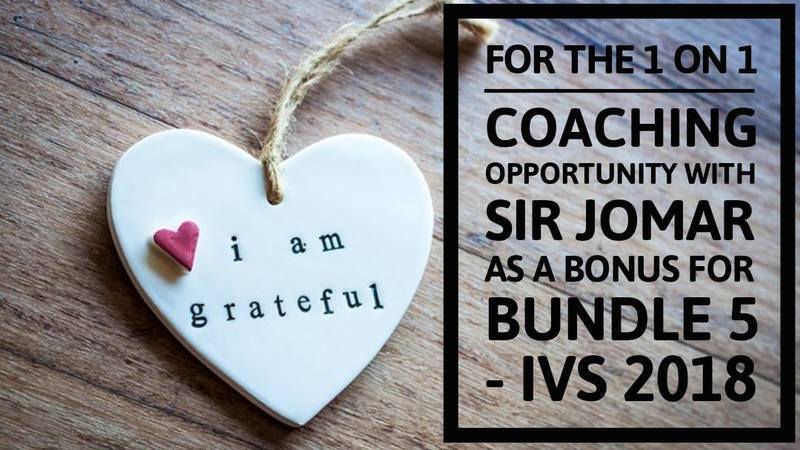 Act now, and let your coach help you make money and enjoy the life of your dreams. 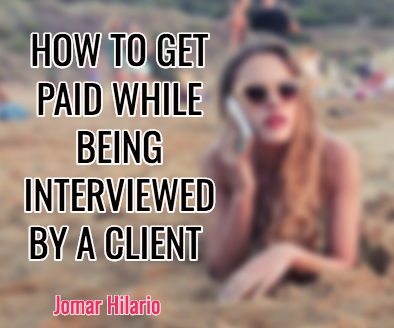 How to get paid while being interviewed by a client & command higher VP price too! Hi! Wonderful to be given the chance to serve you! Lets hop on a Discovery call! Here’s my Calendly.com link so you can pick a date and time for it. Or just reply to this email with your preferred date and time. 2 Options for you : (Your date and time options). The first conversation with a potential client is called an interview. Another mindset you can use is that it’s a “Discovery Call”. It’s STEP1 in doing online/offline sales. It’s usually done by professional salespersons. After all, a Discovery Call sounds serious right? And it sounds like you know something that the potential client doesn’t. Like she’s going to discover something right? Leave it up to the Sales Reps to call it “Discovery Call”. So what’s in the Discovery call? It’s you asking 1 – 6 (it depends on the length of the call) questions and listening. WOW! You thought it was an interview, yes? Remember, this makes you into a Virtual Professional in the eyes of the potential client. There are 2 approaches to Discover Calls. This may be 1 hour long. Maybe shorter if the client has strange to no answers. You’re looking for well-defined answers. This may be your PAID discovery call. 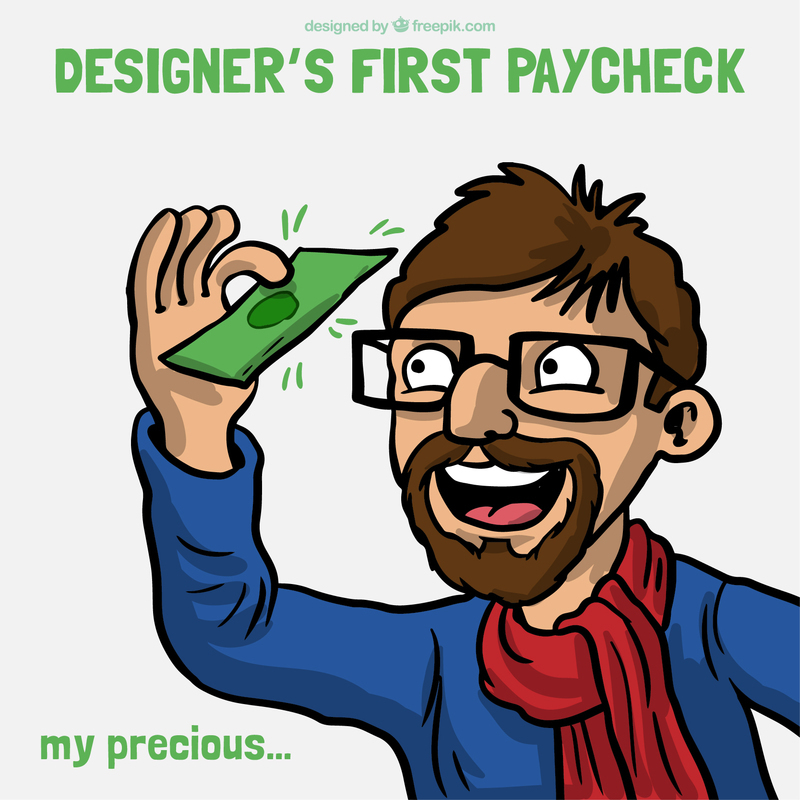 WHAT YOU GET PAID, TOO!? “Hey, I can see you enjoyed this, so did I! Puts a lot of clarity in your business yes? How about we do this longer? 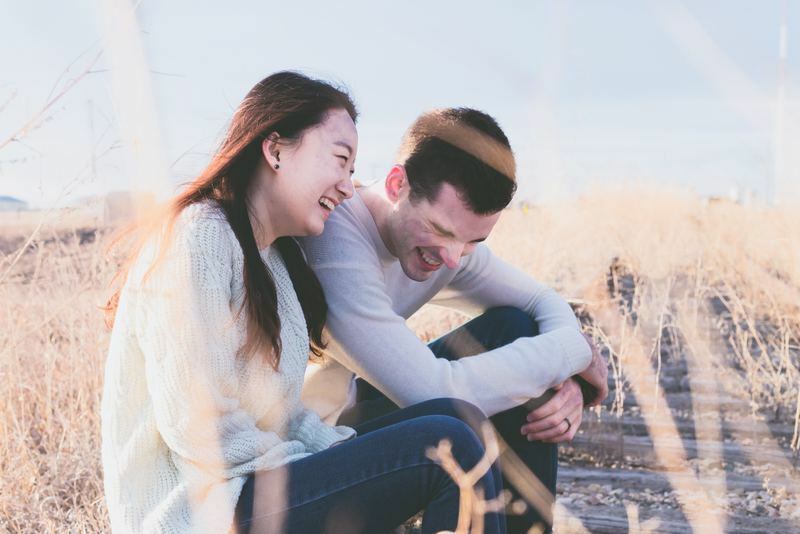 Before we get committed to a monthly relationship – we can hop on a series of calls – to go deeper into your requirements – increasing your clarity and mine as to how I can help you. Ok, I’m going to put a pin on this one as it seems you’re not 100% committed to this. It’s fine. Reply back to me once you’re ready. I’ll ask you again in 6 months (Calendar follow-up in 6 months). Great! Let’s get on 3 calls, each approx 1 hour. This clarity causing Discovery Series (new name, yes!) is only $250 for my time and invaluable to you. Take your pick, but the idea is to make the client TALK and TALK and you LISTEN and LISTEN so you can figure if you will give the client the PRIVILEGE to HIRE YOU or NOT. Note: Yes, Hubspot is a sales software that yes, sales professionals use. No, they didn’t sponsor this post. Calendly also did not sponsor this post. A new way to approach your first meeting with a potential client! Sales professionals have been doing this for ages. Of course, it works. You’re being given a frame of a listening expert instead of a subservient servant. This has been done before. We’re just applying it to VPs. 1. The Best Way To Answer When a Potential VA Client Calls You. 2. 2Million Pesos Online w/o a Virtual Career? How? Explained. Free. 3. Selecting a Niche for an Online Business, easier and harder than you think! How to make money out of the Real Estate Inquiries you’re getting if you try to sell real estate properties (even if you don’t actually make a sale)! A lesson about Copywriting, SIMPLIFIED (with examples so that you can understand easily if you’re a newbie). P.S. Christmas bundles are still up for grabs until FEB 2 only! P.S. Don’t miss out on Jomar’s next Facebook live.